Want to be part of Woodloch's newest trivia game? Here's your chance! 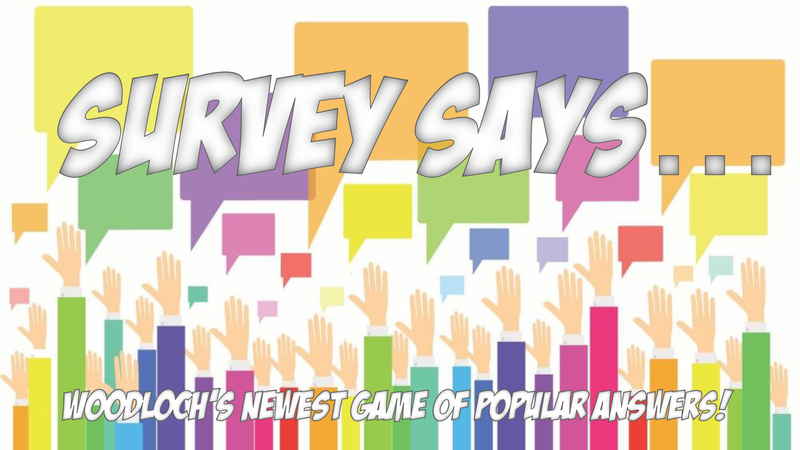 "Survey Says" is our newest fast-paced spin on our fan-favorite "Family Feud" contest- answer the questions below with up to THREE responses! Thank you for the hlep! * 1. Name something you use daily. * 2. Name your favorite specific snack food. * 3. Name your favorite movie. * 4. Name something you NEVER leave the house without. * 5. Name your favorite specific drink at Starbucks. * 6. Name something you love about SUMMERTIME. * 7. Name a specific gift card you'd give to someone as a birthday present. * 8. Name your favorite Woodloch activity. * 9. Name something that reminds you of the Boardwalk. * 10. Name a celebrity chef. * 11. Name a website you visit every day. * 12. Name a classic Nickelodeon Show. * 13. Name a popular video game. * 15. Name your favorite Broadway musical. * 16. Name your favorite breakfast cereal. * 17. Name your favorite board game. * 18. Name your LEAST FAVORITE household chore. * 19. Name a famous lead singer. * 20. Name a University you'd really, really REALLY want your child to be accepted into. * 21. Name something you can never seem to find when you need it. * 22. Name a PROFESSIONAL sports team. * 23. Name something you would find your medicine cabinet. * 24. Name something you'd find in a purse. * 25. Name an app on your phone.